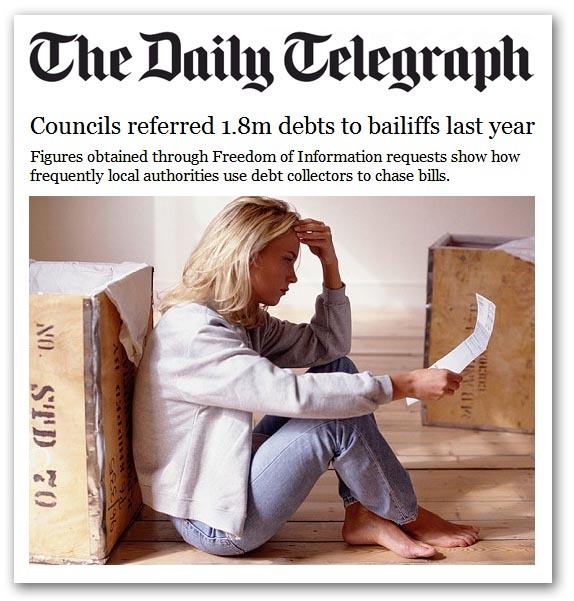 The Money Advice Trust, via The Daily Telegraph and others has established that local authorities in England and Wales last year referred debts to bailiffs on 1.8 million occasions. These debts include council tax arrears, business rate arrears and parking fines, with councils claiming that bailiffs are only ever used as "a last resort". This claim we know from personal experience, and from the experiences of many others, to be a lie. But then, that is what governments do: they lie. Local authorities uses bailiffs for debt collection as part of an automatic (and mostly illegal) process which ends up in these thugs being given a license to extract even more money from often hard-pressed debtors, in a system that lacks humanity or justice. But then, to finance their increasingly extravagant lifestyles and reckless waste of public money, council officials have little option but to resort to threats, bluster and harassment, as they seek to extort increasing amounts of money from an increasingly unwilling population. Alongside this, we also see the news that there are nearly 4,000 prosecutions a week for not having a TV license, with the number of prosecutions having increased by nearly 30,000 in 12 months. More than ten percent of all cases coming before the courts are for TV licence fee "evasion", we are told. This is yet another tax that lacks legitimacy, and thus we find people increasingly reluctant to pay. And once again, the establishment response is to flex its muscles and resort to threat, bluster, harassment, and then penalties, force and eventual imprisonment. For all its claimed concern for women's rights and equality, the BBC here is excelling, making sure that a high proportion of women are jailed. But this is but one example of the government at war with its own people. Although that war has not been sanctioned by an overt declaration, and is poorly reported by the legacy media, day after day the shock-troops of oppression (BBC report) sally out from their bases, to spread their fear and misery. Meanwhile, the forces of darkness are seeking means of increasing their "take", in this case the police seeking to by-pass the "referendum lock" that prevents an increase in Council Tax without a referendum. As we see from the BBC film report linked above, where the police support the illegal actions of bailiffs, we are moving to a situation where the police forces' main activity will be collecting their fees from unwilling householders. But, if our government and their agencies have launched an undeclared war against us, it is about time we started to fight back. Of course, some of us are but this is also a numbers game, and not everybody needs to go as far a North Jnr (although they are welcome to join him). Even people deducting a penny from their annual Council Tax bill can take part in the battle. We are working up a scheme on how to organise this, under The Harrogate Agenda label, with the idea that it should be called the "Penny Revolution". As I wrote earlier, me doing this is a [very] slight irritation. A thousand people doing this is a problem. A hundred thousand people doing this is a crisis. A million people is a revolution. We have within us the power to make things change. All we need to do is use it. Sadly, many people can't see the point, or can't be bothered with the inconvenience of having to make payments manually, instead of relying on automatic direct debit payments, happily giving government access to their bank accounts. But if we cannot even be armchair revolutionaries, there is little hope for us. One by one, we get picked off by state thugs, who know only one thing – to keep coming as long as there is money to be extorted. Sooner or later, we are going to have to stop them. My feeling is that now is as good a time as any.